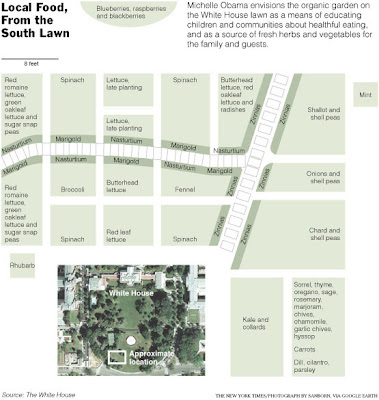 This week, Michelle Obama broke ground on a project close to my heart: A White House organic "farm." I wrote about it in detail in my column, Food for Thought, on TrueSlant.com. The Obamas are not the first First Family to grow one on the White House lawn. Eleanor Roosevelt introduced the idea during WW2. Families across the country followed suit with small plots of land where they grew their own fruits and veggies to put on the household table. Above is a neat diagram of what the new plot at the White House will look like. Alice Waters has been petitioning Presidents for years to start one but I can't imagine Laura Bush nor Hillary Clinton getting their nails dirty. And they didn't. Did you see 60 Minutes last night?